This holiday accommodation is just a short walk from the centre of the little town of Santa Venerina on the slopes of the Etna. The house has two outdoor areas. 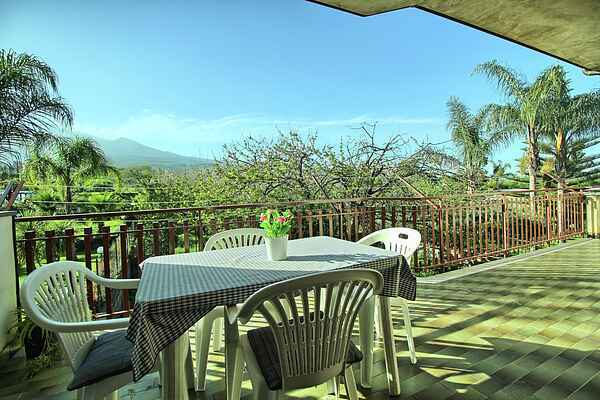 Firstly, a large balcony with sea views, and secondly a large terrace with a view of the cherry garden and the volcano. Enjoy the view with a good glass of Etna wine while waiting for an erruption. The holiday house is fully equipped. The house directs its surroundings are very quiet and pleasant, on a walking distance from the essential services such as a pharmacy, a supermarket, shops and a bank are within walking distance. The holiday apartment is a convenient starting point for exploring the east coast of Sicily. Visit the baroque in nearby Acireale and Catania, visit the mondaine town of Taormina and the beaches in Giardini Naxos. A day on Mount Etna is a day to remember.